Having a blackout survival kit was something that was unheard of until just recently. Technology has really come a long way in just a short time. Electrification initially began to grow from the 1880s to the 1960s. At first, it was only the rich who could afford what was considered a luxury. So many people during those times were not dependent upon electricity as our society has become. They were mainly self-sufficient. Now many of us can’t imagine being without electricity for just a few short hours. We’ve grown accustomed to having air conditioning, lights, and television. It is a way of life now to have it. As a matter of fact, a lot of places in the United States require being connected to the electrical grid. So when a blackout happens many of us freak out like it is the end of the world. Still many of us experience short-term blackouts due to natural disasters, inclement weather and power failures. On top of that, there is the risk of an EMP attack that would leave us in the United States without power for at least 18 months. This is why it is important to have a blackout survival kit included with your home preparedness system. What happens in a blackout? When the power goes down you are going to lose a few things. Obviously, you are going to lose power for lights, cooling/heating, and communication. Lighting isn’t imperative to survival but is extremely helpful and makes surviving a lot easier. However, cooling/heating can have a huge effect on your survival depending on where you live. If you live up north where there are brutal winter storms then you could be in danger of frostbite or hypothermia. For those that live in hotter climates, you could be in danger of heat strokes and dehydration. Communication is another important aspect of survival. It can be a survival multiplier. Communication can give you warning of impending danger like a military invasion or even less extreme circumstances. It can also give you information on relief efforts. Just recently in Florida, we experienced a hurricane that took down our power for two and a half weeks. The cell phone towers were down so I wasn’t able to communicate with friends and family that way. Luckily we had HAM radios and walkie-talkies. This was helpful to communicate needs to each other as a lot of people were without food and water. It was also helpful to communicate for security in our neighborhood. Luckily our blackout survival kit was able to provide us with enough power to keep those devices functioning. What is a blackout survival kit? 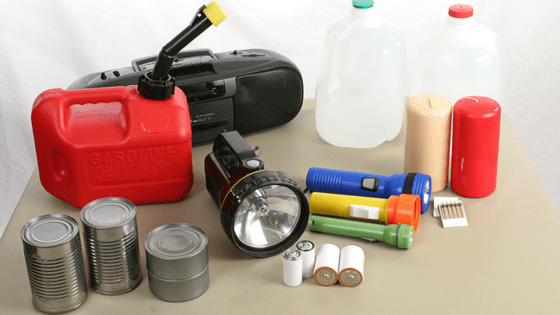 A blackout survival kit is preferably a small container that contains essential items that you can quickly grab to adjust to being without power. It is designed to help you safely get to your preparedness and survival supplies quickly. The kit should be in a designated place where you will have quick access in the dark. Of course, you will want to have your other preparedness and survival supplies in the standard places. I would recommend placing these kits in drawers, nightstand and end tables in every room of your house. That way you don’t have to walk to one particular room in the house in the dark. It should be communicated to your family members where these kits can be found. I would recommend placing glow in the dark tape on them. That way they can be easily seen. These kits should provide enough backup power for up to 72 hours. For more of a long-term grid-down scenario, you should have other backup sources of power. Typically you can place those items in your pantry or garage. 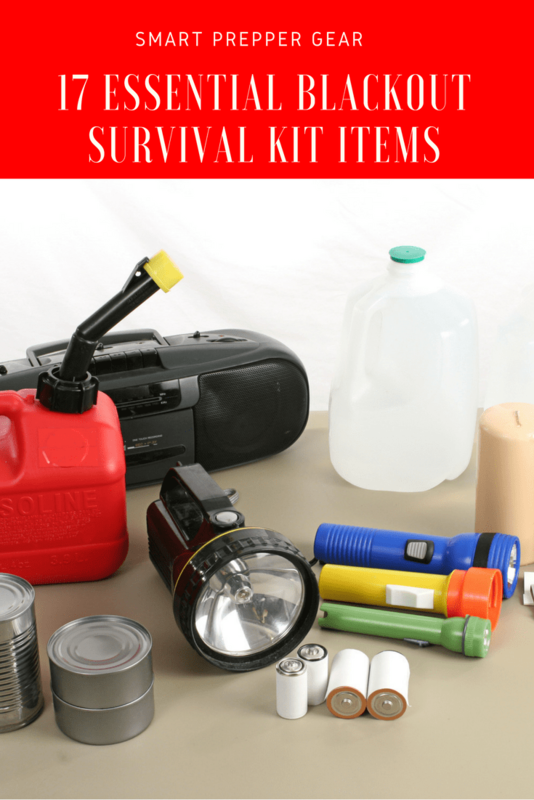 The blackout survival kit is designed to help you get to your preparedness and survival supply. This kit isn’t designed to survive off of alone. However, you should eventually build up a supply of backup power for anything over 72 hours. Again, this kit is only designed for up to 72 hours. Once you are able you should stock up on other sources of power. Having a generator and a portable solar power charger would be helpful. I also have LED lanterns. These bad boys produce a lot of light and are battery powered. The gas powered lanterns typically create a lot of heat. Living in Florida it just isn’t a good idea to have that much heat being produced. If you do get another type of lantern make sure that it is safe to use indoors. Altogether these would be my suggestions for a blackout survival kit. If you have any other suggestions or feedback then please leave them in the comment section below. Your feedback helps the community prepare the smart way now so that we can thrive later.